The recent non-scientific Sunday Poll on how Illinois should fund road infrastructure maintenance/improvements was because of current political commercials in their heated race for governor. J.B. Pritzker is up with a new ad, attacking GOP Gov. Bruce Rauner and an affiliate of the Republican Governors Association over ads criticizing the Democratic governor candidate about a vehicle mileage tax. The Rauner ad features a woman identified as “Denise Smith” warning that Pritzker “wants a car tax, which will also come along with a tracking device.” State Solutions, an RGA affiliate, accuses Pritzker in an ad of plans for a 1.5-cent-per-mile vehicle mileage tax. This is equivalent to a $0.30/gal increase in state motor fuel taxes and a 50 percent increase in vehicle registration fees. The tax and fees should be indexed to the consumer price index to keep pace with inflation. MPC recommends the state constitution be amended to create a transportation trust fund to protect this revenue. To acknowledge the effect of these increases on lower- and middle-income Illinoisans, the state earned income tax credit should double to 20 percent of the federal amount. 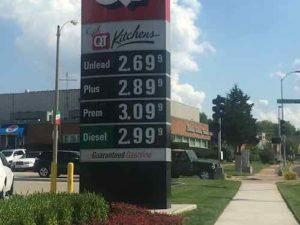 The Illinois Senate has used the MPC’s estimates to draft legislation that would raise the gas tax by 30 cents, making it the highest gas tax in the nation. Of course, not everyone is happy with that proposal. The Illinois Chamber of Commerce says Illinois needs to look into other options to fix roads. The Chamber’s recommendation includes an increased state income tax and a lower wholesale gas tax, while getting rid of some tax exemptions for goods like food and medicine. Drivers could have a device that tracks the miles through geolocation technology, charging only for the miles driven on public highways and roads. Alternatively, they could have an odometer tracker, which reports only number of miles driven, not where. The downside to this, notes Susan Martinovich of CH2M, an environmental and engineering consulting firms, is that drivers would be charged for miles driven out of state. Finally, Illinoisans could opt out of installing any devices and pay a flat mileage tax of 1.5 cents per mile for 30,000 miles. Cullerton, a Democrat, introduced SB3267 in February 2016. It never got far in the legislative process. I want to step back from politics and look at the big picture. The first US state tax on fuel was introduced in February 1919 in Oregon. It was a 1¢/gal tax. In the following decade, all of the US states (48 at the time), along with the District of Columbia, introduced a gasoline tax. By 1939, an average tax of 3.8¢/gal (1¢/L) of fuel was levied by the individual states. These CAFE standards have been highly effective at improving the fuel economy of vehicles. Less fuel, however, means less revenue for roads. Politicians at the state & federal levels are reluctant to increase fuel taxes. The smart solution is to look at a Vehicle Miles Traveled (VMT) tax. Oregon, the first state with a fuel tax became the first state to begin a test of a mileage tax. Way back in 2001, Oregon recognized the problem that many state legislatures are now staring down: gas tax revenue is falling inexorably as vehicles become more fuel-efficient, threatening transportation budgets. The state launched a task force that investigated 28 alternative funding mechanisms before selecting a mileage tax as the one that best met a wide range of criteria: fairness, efficacy, ease of implementation, public acceptance, enforceability, privacy protection, etc. * A small GPS receiver in participants’ cars tracked miles driven. * When participants went to the gas station to fill up, a wireless scanner at the pump detected the GPS receiver and recorded the car’s current mileage, which was then sent to a central database to determine miles driven since the last payment. No specific location data was transmitted. It’s time to change how we fund road construction.